Why Choose Frederick Air for Your New System? - Frederick Air, Inc. There are a lot of reasons to choose Frederick Air to be your installing contractor. We have spent over 20 years perfecting a system that consistently delivers a quality product. We’re dedicated to putting qualified, pleasant, respectable people in your home that will get the job done in a timely manner. If you do choose Frederick Air, after signing the agreement, our installation manager will contact you to arrange a time to come by and take all the required measurements and gather a material list. This way, when the day comes to perform the installation, a few technicians will show up with everything they need to complete your installation as fast as possible, usually the same day. I guarantee they will leave your home as clean or cleaner than the way they found it. You won’t have to worry about foul language, loud music, or people smoking in your home. We work hard to ensure our field personnel are happy in their jobs. In fact, in 2007, we were selected as one of the top 10 family-friendly businesses in Frederick County. After the installation, the system operation will be fully explained, and any questions you have will be answered. That’s not where our relationship ends. In fact, that’s where it starts. Through our planned maintenance program, you will be a part of the Frederick Air family for years to come. After all, we hope to replace your next system as well or maybe your children’s system. 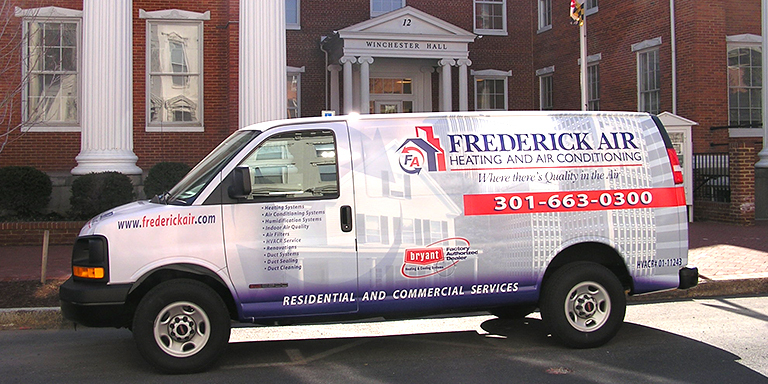 At Frederick Air, our mission is simply to provide the residents and businesses of Frederick County with the highest quality service, maintenance, and installation of heating, ventilating, and air conditioning equipment while maintaining a family-friendly work environment for the company’s employees and do it so well that it’s profitable. Well, that’s the Frederick Air story. We hope to serve you soon! This is the last article in our 5-part series, Secrets to Buying an HVAC System. Have you seen them all? [Current Article] Why Choose Frederick Air for Your New System?